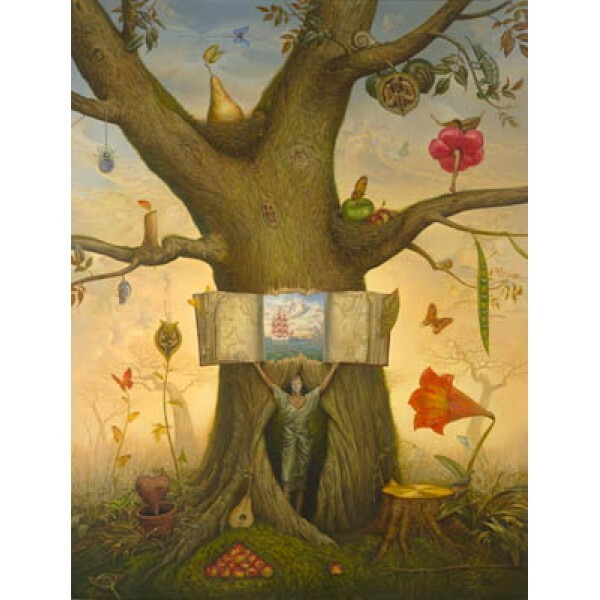 The painting represents the genealogic tree of art of Vladimir Kush. While ascending the tree we can trace the birth and the development of his images and ideas as well as their interconnection. On the lowermost tier, cluster the sprouts - the poppy pod-cell, blossoming horn of the gramophone, heart plant with an arrow shoot. At the foot are scattered the peculiar fruits fallen from the tree: the pear-mandolin, apples ready for billiard battles. The trunk became a dwelling of the mysterious Roman emperor Nero. He invites us to sit down into a boat and opens the atlas of the Genealogic journey. Around on the branches hang, nest and blossom images of strange flowers and fruits: the dancing hibiscus, walnut house, pod with peas-oarsmen. Upper tiers are inaccessible to our sight. We only see the soul of Icarus flying up toward the sun and the arrow of time soaring through the sky.